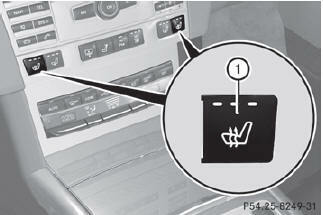 The system automatically switches down from level 3 to level 2 after about eight minutes (driver's seat and front-passenger seat) or five minutes (rear seats). The system automatically switches off approximately 20 minutes after it is set to level 1. 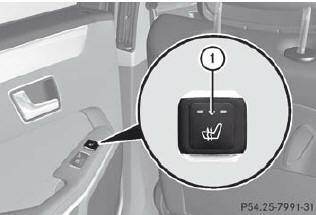 •► To switch on: press button 1 repeatedly until the desired heating level is set. •► To switch off: press button 1 repeatedly until all the indicator lamps go out.